Kicking off the Labor Day weekend with the Domaine Virginie Thunevin AOC Bordeaux, 2009. 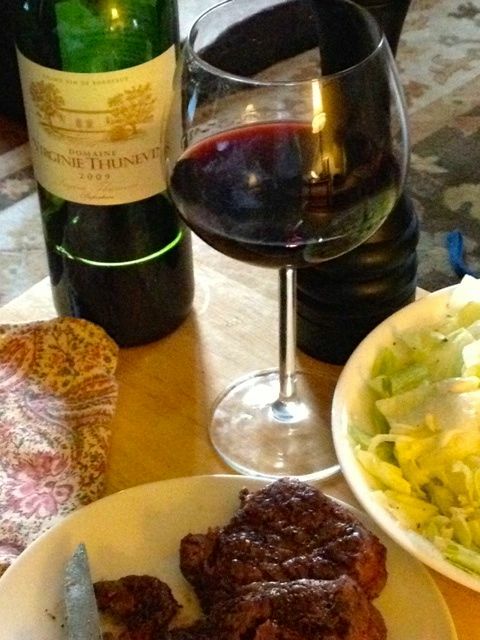 After a “preview” glass on Thursday, this Bordeaux set up one of our favorite meals tonight–complementing filet mignon steaks (including java rub) right off the grill and blue cheese salads with the crumble, pepper, and the dressing. As expected, the pairing worked really well and was first time in several weeks we opted not for a Pinot Noir or Cabernet Sauvignon but rather a red blend. This one, developed by winemaker Jean-Luc Thunevin, is a mix of Merlot (70%), Cabernet Sauvignon (20%), and Cabernet Franc (10%), and named for his daughter. We have a couple more bottles of the Domaine Virginie Thunevin so I’ll tackle more of his craft in future posts and focus here on the initial feedback we had on its taste. With that said, “fruit flavors” is the prevailing thought I’d offer on this Bordeaux. You want to swish it, savor it, and swirl all about your mouth because it just feels juicy. Even without aging, its a very full taste and has a very fruity aftertaste on your tongue. Easy tannins. I haven’t yet been able to isolate the berries that your tongue will taste with the Domaine Virginie 2009, but it’s definitely less in the raspberry/strawberry world and more on the blackberry/blueberry path. Almost seems like a liquid version of a delicious berry pie? So far so good on this wine…three more to go from this initial shipment and each one promising!